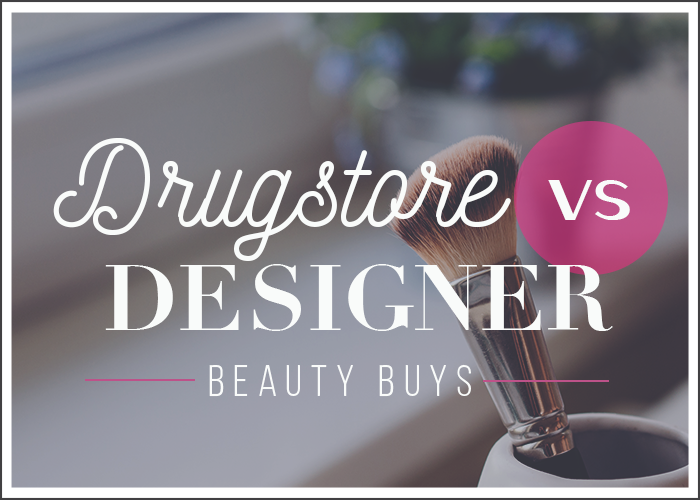 A few days ago, one of our readers suggested that we write an article taking the most popular and highly-rated designer beauty products, and point to awesome drugstore swaps. SO WE DID! I like to think that I’m pretty levelheaded when it comes to spending on beauty products for myself, but I still manage to overspend. I find myself running to the drugstore + Sephora to replenish my makeup bag on a way too frequent basis. The TFD team has written about our favorite beauty products that were worth splurging on, and the purchases we truly regret having spent money on. For me, the items I tend to most regret buying are ones that feel superfluous, like misting/setting spray, highlighter, eye primer, lip scrubs, pore minimizers, etc. 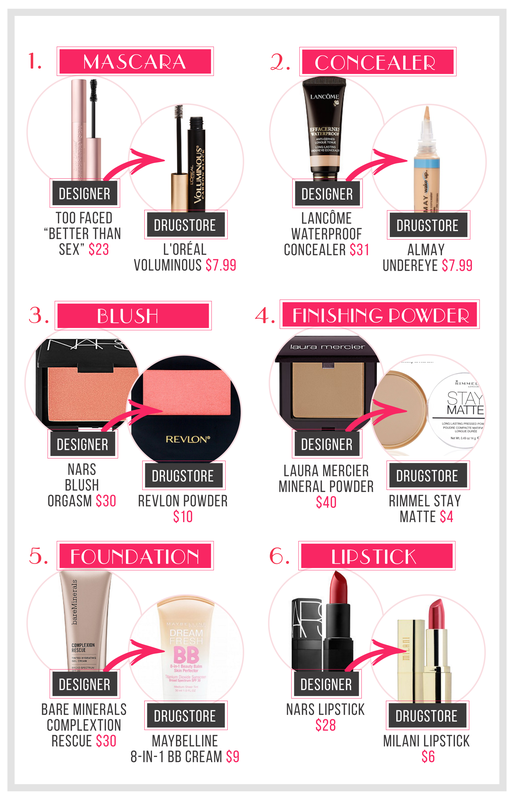 The cost of these “supporting” items that I use before I even get into my actual makeup routine, can add up fast. I know that some people love and swear by them, but in my opinion (which again, could totally be at odds with your own), I rationalize it because I’m riding the wave of my “no frills” mid-20s mentality. Having a pared-down beauty routine, where there are less “problem areas” to cover up/enhance/tweak, is one I’ll ride out for the next few years. Of course, that doesn’t mean I’m letting up on my SPF moisturizer or under-eye cream routine anytime soon, but overall, the fewer steps I have to go through each time I get ready, the better. I’ve been using the L’OREAL Voluminous mascara for years now. Sometimes I splurge on “better quality” designer ones, but this is one of my tried-and-true favorites that never lets me down — and it costs a cool $8. The curve of the brush is fantastic, the color is true black, and it consistently receives ~rave~ reviews. This was a particularly tough one to decide on because there are a ton of good drugstore concealers out there, in my opinion. I’ve almost never purchased one that costs over $15. Concealer is supposed to be invisible anyway, so I always figured that it was the easiest place to cut back when spending money on beauty products. I’m a s u c k e r for nice blushes. Perhaps it’s the packaging, and to me, all those stylish compacts with the mirrors and mini-brushes make the super tempting to purchase. However, I know that for the amount of blush you’re actually getting, $30-$50 is waaaaay too much to spend on just one of many products you need/buy. This Revlon brand blush is fantastic, goes on smooth, and lasts all day. WIN. I used to use the Maybelline cream-to-dry powder for years, but I recently switched over to the Rimmel Stay Matte version, and love it. Beauty sites call the Rimmel powder “life-changing,” and I admit that all the reviews I saw were off the charts, which is the reason I picked it up for myself in the first place. It’s got an awesome silky light finish, and costs like $4 (which is just unreal when you consider some people drop $50 a pop on designer powder). Some other fan favs are Revlon ColorStay and the Physician’s Formula Mineral Wear powder. I’ve been on the BB cream foundation train for some time now (who doesn’t love a product that accomplishes, like, five different things in one). However, since I have sensitive skin prone to breakouts, I was too afraid to try anything other than the pricey BareMinerals brand foundation. After asking around, and doing some digging on my own, I went out and tried the Maybelline BB cream version. Holy hell, it’s just as good, goes on smooth, and has just enough coverage to make me feel “finished.” It’s eight bucks, and doesn’t set me back when it comes time to top up multiple items in my makeup bag at once. BONUS — it does eight things in one, so be prepared to feel ~aMaZeD~ at how much this lil’ tube can do. The only designer lipstick I ever bought was for my wedding day (I wore NARS lipstick in Rita). But, I truly felt like I had been stabbed in the heart when the cashier at Macy’s rang me up for a cool $34. 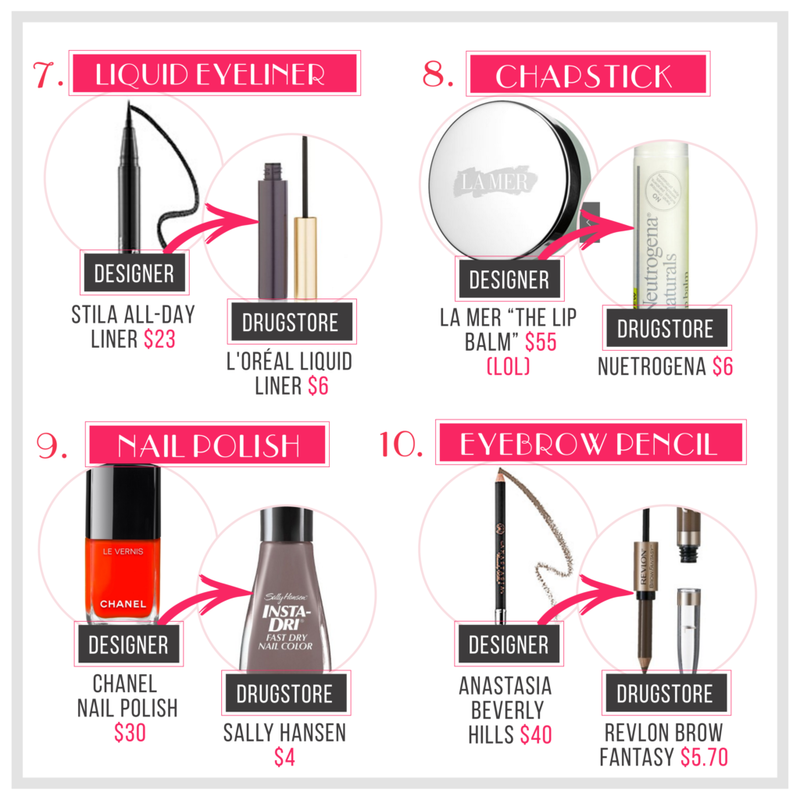 I vowed that I would never spend that kind of money again, and swiftly return back to my drugstore favorites like Maybelline, Revlon, and CoverGirl. Chelsea loves Milani brand lipsticks, and while I, myself, have never bought a tube (I’ll steal a swipe from her on occasion, heh) she’s a Milani lipstick devotee. She says, “It’s by far the best lipstick I’ve used, regardless of price, and the colors are #ChicAsHell. I’ve converted many a nonbeliever.” I’ll trust you on that one, Chelsea. Oh liquid eyeliner, how I love thee. I wear it every day, and I’ve been through my fair share of different products. Chelsea swears by the L’OREAL Lineur Intense Brush Tip Liquid Eyeliner in Black. She says, “I spent years wasting money on Stila, and this liner works way better for seven bucks.” Nearly every liquid eyeliner that I’ve tried smudges on my eyes, and don’t even get me started on the little pots you have to dip a brush into and draw on (*kills self*). Again, I trust Chelsea’s verdict on this one, and will be out purchasing the L’OREAL version the next time I’m at the drugstore. Few purchases feel more luxurious (and unnecessary) than designer overpriced lip balms. Sure, the Sugar brand lip scrubs are nice to get samples of, but I’ll never be someone who drops a chunk of money of a lip conditioning product. There are a TON of DIY lip scrubs here, so there’s really no excuse to never not have one on hand. If you’re looking for an all-natural lip balm/conditioner, it’s hard to find a higher rated one than the Neutrogena brand one. It’s ~vitamin packed~, cheap, and really effective. Those Chanel nail polish bottles are so damn chic, and are all over sites like Pinterest and Tumblr (which make it super hard to ignore). However, not everyone has a spare $30 bucks to drop on a single color. In my opinion, I change my nail color way too often to ever justify spending $30 on one shade. Salley Hansen is a Reddit fav, and if there’s anything I trust in, it’s the Reddit community’s ability to upvote a truly spectacular brand of nail polish. Salley Hansen brand doesn’t chip, and I find that it lasts longer than a lot of other drugstore brands I’ve tried. Eyebrow pencils are tricky because you have to select just the right color, which isn’t easy. However, it’s particularly painful to spend a lot on this item because it’s just one of many I need when I go out to refresh my makeup supply. I always bought the Anastasia Beverly Hills brand after my sister turned me on to it, but I find the pencil barely lasts a month. I can’t drop $23 every time I need a new brow pencil, so I was forced to find a more cost-effective version. This one rocks, and I (and the larger beauty community) recommends it as a top pick.